At Metrofone we are committed to bringing you a wide range of pay monthly deals on all of the handsets we have in stock. We ensure that we have the broadest range across all of the manufacturers because we know that every one of us is different and having a choice is a positive thing. Our mission is to make sure that you get the handset that you want at a price you can afford and, of course, are happy with the service we provide. 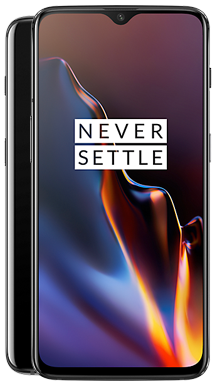 OnePlus are a relatively new name on the scene when it comes to making mobile phones so you may not be familiar with their work; however, they have been producing high-quality smartphones since 2013, and their handsets are sold in over 50 countries around the globe. The handsets they provide are a combination of high quality, excellent design and feature packed so well worth finding out more about. Since they launched in the UK, this Chinese based company has sold an increasing number of handsets with every new phone they bring to market, at a rate that confirms that the technology they supply is fantastic. It is also evidence that they have now left the newbie stables and have progressed to the main arena with other big mobile phone names. There are currently five handsets on their books with the latest OnePlus 6T just coming to market in the UK now, and one of the wide range of handsets we are delighted to stock. Favouring the currently popular infinity screens, they certainly seem to have a handle on what people want. While they have yet to foray into facial recognition technology, the in screen biometric scanner is first rate, and this is technology not seen by many other manufactures yet, with most others option for sensors on the front or rear of the handset. The design of their handsets has a distinctly premium feel, and the screen quality is first rate, with their newest handset utilising AMOLED technology which we know to be superior. The quality list doesn’t end there, with the 6T boasting dual camera technology with a whopping 16MP and 20MP lens; this is one powerful camera. The handsets feature Snapdragon processors and of course run Android OS, so you are looking at a superior performance. Here at Metrofone we only work with EE, and there is are some very good reasons for this exclusive partnership. Firstly, while we want to offer you a great range of choice when it comes to your next handset, we also do not want to bombard you with deals from loads of network partners and leave you scratching your head in confusion. We have negotiated a wide range of contracts from EE that still offer you loads of choice when it comes to data allowances, up-front costs, talk time and texts, plus they have also generously provided a great range of free network gifts which makes the offers even better. So you have a stunning choice without overload. EE also has one of the best coverage levels across the UK, and we know how frustrating it is to struggle with your mobile phone service because you do not live in a major town or city. We know that EE has awesome urban coverage, but we can also be confident that our rural customers will still be able to get a great level of connectivity and 4G coverage wherever they might be. There is nothing more frustrating than taking your phone out to make a call, check your email or anything else for that matter and then discovering you have no signal or connection with which to do so. We also know that EE is leading the market on free calls within the EU which is a big bonus if you have to travel a lot or spend a lot of time calling abroad. Of course, because they have such great coverage areas, you will also find your handset is available to use no matter where in the EU you are. We mentioned no upfront cost, and we know that this is also really important to our customers, what this means is that you can have the handset you choose without having to pay anything at the start of the contract apart from your monthly payment. So, basically, all that is left is for you to identify the level of data that best meets your needs and check out the deals from there. If you are unsure of what level of data you need then be sure to give our customer service team a call as they know how to estimate the best level for you. The rule of thumb is to find the level and increase it slightly so you can be sure you never run out and end up with an extra charge at the end of the month. Some of our deals also come with cash back options which make the deal even sweeter. In some cases, these are automatically calculated and applied for you, whereas in others you will need to remember to claim your cash back once the contract is up and running. In that case, details of how to claim will be sent to you, so have no fear about knowing what to do. If you think that the new OnePlus 6T might be the handset for you, and decide to place your order, then we have one more treat for you. We will arrange to get your new handset delivered the very next day, and there is no extra charge for this service. This does not apply to pre-orders but any handset that is on the market already we will rush to you for the very next day because we know how exciting having a new phone really is. Finally, if you have any questions about any of the deals that we have on offer, or specifically about the OnePlus 6T, then you will be pleased to know that our customer service team are on hand and happy to chat through any questions you might have. They are based in the UK and can be reached on 0333 900 1144.